The Financial Crimes Investigation Division (FCID) will conclude more investigations very soon and frame a new charge sheet against former Minister of Economic Development Basil Rajapaksa in connection with the super-luxury Rs 240 million house in Pugoda. This comes in a sequel to two witnesses making statements in the Pugoda Magistrate's Court last Friday disowning the newly constructed Rs 240 million luxury house, and to the contrary stating that the house under reference is in fact owned by former Minister of Economic Development Basil Rajapaksa. Muditha Jayakody, the architect who drew the plan for the house, told the magistrate that he is not the owner of the property, although the deeds were in his name. He claimed the real owner of the house was Rajapaksa and that it was Rajapaksa who exclusively funded its planning and construction. 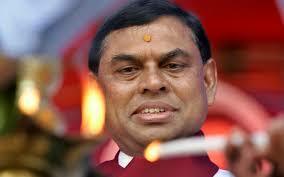 The building contractor, Ramawickrema of Kadawatha, also claimed that Rajapaksa paid for the construction. The FCID interviewed Rajapaksa following these two statements in Court but Rajapaksa maintained denial of ownership. Magistrate Ruwan Pathirana finally accepted the FCID's arguments and ordered seizure and sale of the property by auction, further ordering that the sale proceeds be deposited in the Treasury. Case number B8674/15 MC Pugoda was filed by the FCID last year calling for an investigation into money laundering and to establish the ways and means whereby the former minister amassed such an inordinately huge income by which he constructed the Pugoda house. Based on facts which have come to light to date, the FCID will now make further inquiries to establish true ownership of this house, an FCID official said. Chief Inspector Ranasinghe and Sgt. Gunasekara appeared for the FCID.